All Hallows by The Tower is the City of London's oldest church with its beginnings in 675AD. It has had a turbulent history and it's proximity to the Tower of London has meant that it has often been central to many of histories more violent scenes. The church was where beheaded bodies from the Tower of London were brought to be buried among which were Thomas More and Archbishop Laud. The church also witnessed the start of the great fire of London as Pudding Lane is close by, luckily it survived. 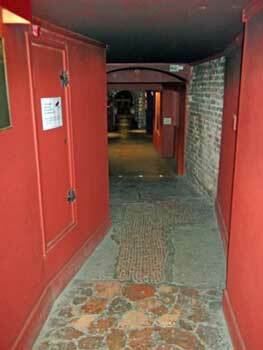 Beneath this old church they have created a small museum in the Crypt which outlines the varied history all Hallows by the Tower and also some of the famous people who have passed through. Sat - Sun 10am - 5pm (except during services). London Pass holders are entitled to a free Pitkin Guide to the church on presentation of their Pass. 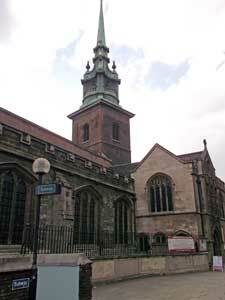 To visit the museum is to also visit All Hallows by the Tower Church as one is inside the other. this is no hardship as the church itself is a beautiful peaceful space brimming with history and stories to tell. It is not a large church and remains a working church even in its rather touristy position as well as being badly damaged in the Second world War. As you walk round the church you will not fail to notice it that it has many military ties. Various stained glass windows commemorate lost vessels and seamen and models of tall ships are suspended from several arches. 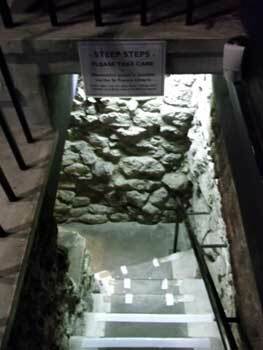 To reach the museum you walk under the restored organ down some very creepy looking stone stairs. 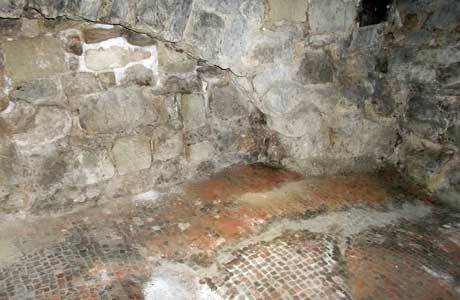 The first thing you see is a archway which dates back to the churches earliest medieval period. Also in front of that there is an original roman pavement which was discovered in 1926, which is a reminder that this site has been populated for over two thousand years in one way or another. It never fails to take my breath away when you are in the presence of something so old and so familiar as a pavement, you can almost feel the past coming to life in front of you. Moving on through the crypt museum you walk through a narrow corridor which has either side of it varied display cases. They contain various historical fragments from the churches' history such as ceremonial silver plates and goblets to historical documents such as marriage registers. One of which shows the marriage of John Quincy Adams the sixth President of the United States who was married here in 1797. There are also fragments of headstones and memorials which were damaged during the war. One of which is a very large metal plaque which commemorates the life of William Penn who founded Pennsylvania. Penn was baptised in the church and also studied in the old school room (now the Parish room). 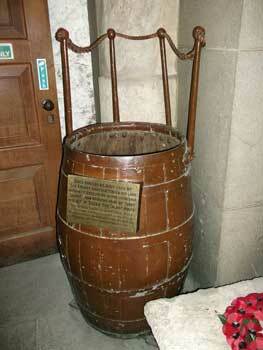 The museum is fascinating and its location in the crypt gives it an air of excitement and wonder. The whole experience was a real treat for me and even though it only takes about 15 minutes to walk through, you really do get a real sense of the church and its rick history. At the end of the museum is a small chapel which is lined with small ceramic boxes inscribed with the names of the departed who are interred there. It is an odd sight and does rather stop you in your tracks but it is good to remember where you are and remember those who have gone before us. Just before you climb the stairs back up into the church you are confronted with two very odd bed fellows. A display on the wall of badly worn simply wooden crosses which were brought back from the battle fields of the first world war and the barrel Crows Nest from Earnest Shackleton's last voyage to the Antarctic. Two items I did not expect to see in this London museum but both very poignant in their separate ways. This is a great little London Museum and well worth visiting especially if you are also visiting the nearby Tower of London.